The yield curve inverted Friday triggering fears of a recession and a 1.9% drop in the Standard & Poor's 500 — the second-worst one-day drop this year. Then, Robert Mueller's Special Counsel delivered his report. 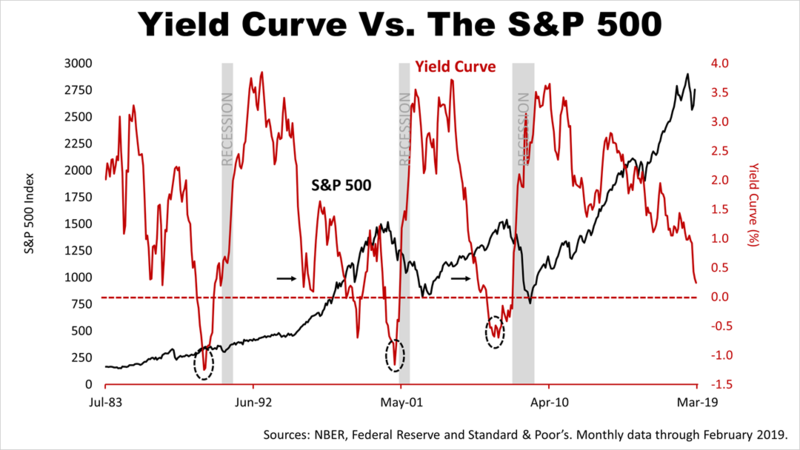 The yield curve inverted for the first time since the last recession, and it has historically preceded recessions by many months. However, the yield curve's inversion does not always mean a recession is going to occur, and all of the key fundamental economic indicators show no sign of a recession. The index of U.S. leading economic indicators — a forward looking composite of 10 indexes of American economic growth — increased 0.2% in February to 111.5, following no change in January, and a 0.1% decline in December. 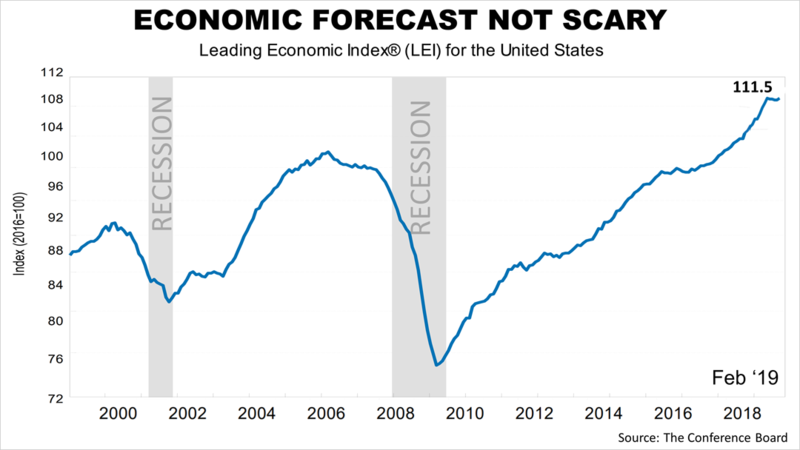 While the economy will continue to expand in the near-term, economists at the Conference Board, which administers the LEI index, said they expect the pace of growth might decelerate by year end. However, fundamentals reflected in the LEI currently do not portend a recession. Average hourly earnings for blue-collar workers rose by 1.7% in the 12 months through December, and by 11.6% in the 10 years through the end of 2018. 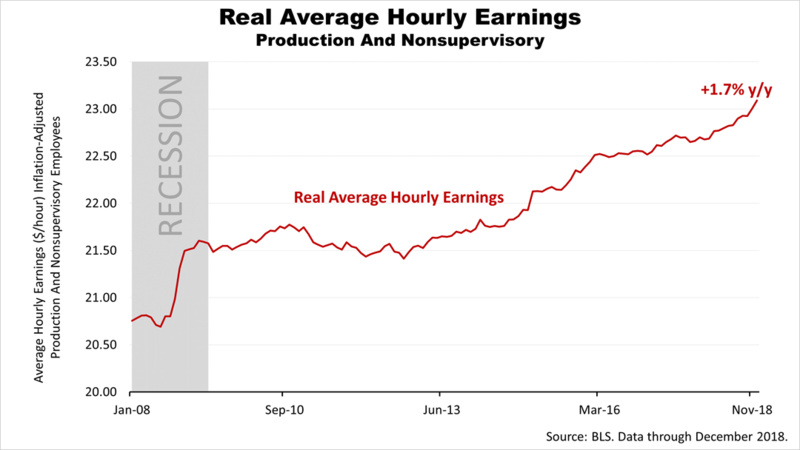 Including managers and white-collar employees, real hourly earnings of all U.S. employees was up 11.5% over the 10-year period. Since American consumers contribute 70% of U.S. economic growth, and real wage gains translate into increased spending and drive economic growth, this is a key fundamental driver of growth. 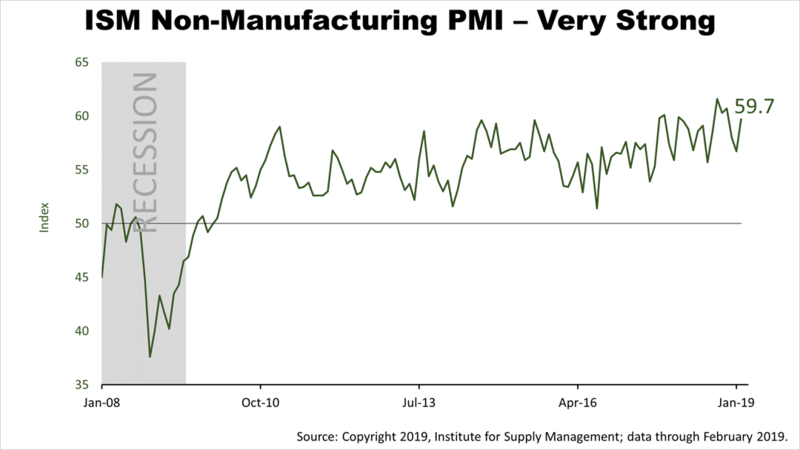 Another key fundamental indicator released recently, a monthly survey of purchasing managers at large companies, showed very strong growth in February. A key forward looking component of this index, which measures new orders, is extraordinarily strong relative to its historical pattern. Since 86% of U.S. businesses are not manufacturers, this captures a much more influential segment of the economy. 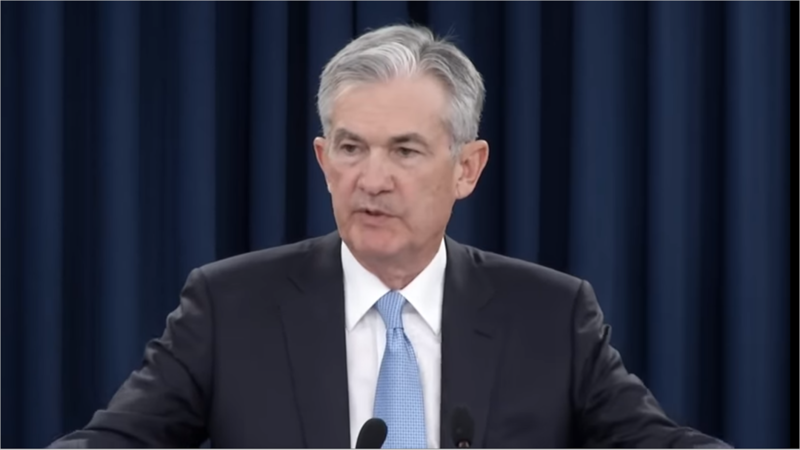 At a press conference this week, Federal Reserve Chairman, Jerome Powell, said that the U.S. economy was decelerating but remains strong. Mr. Powell indicated the Fed is unlikely to raise rates in 2019, a very accommodative stance afforded by low inflation expectations for the foreseeable future. 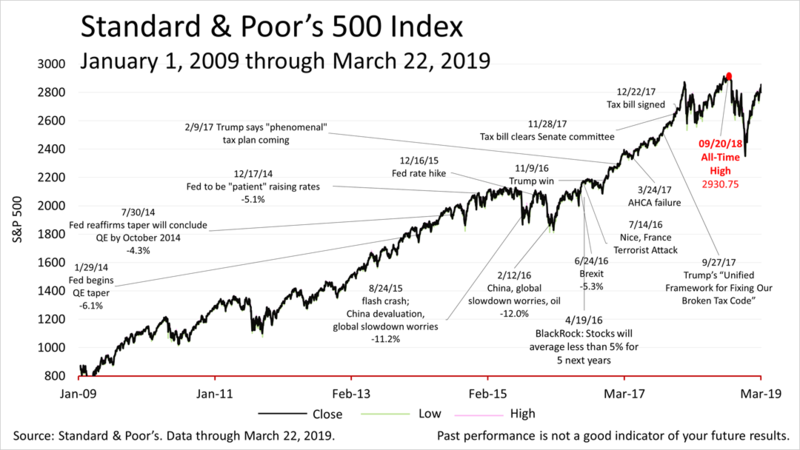 Predicting the future of the U.S. economy is hard and no one can predict the future of the stock market or any particular investment with certainty. But the much-dreaded inversion of the yield curve, in the context of the key fundamentals of economic growth and its long-term history, is not as scary as the drama reflected in the media. 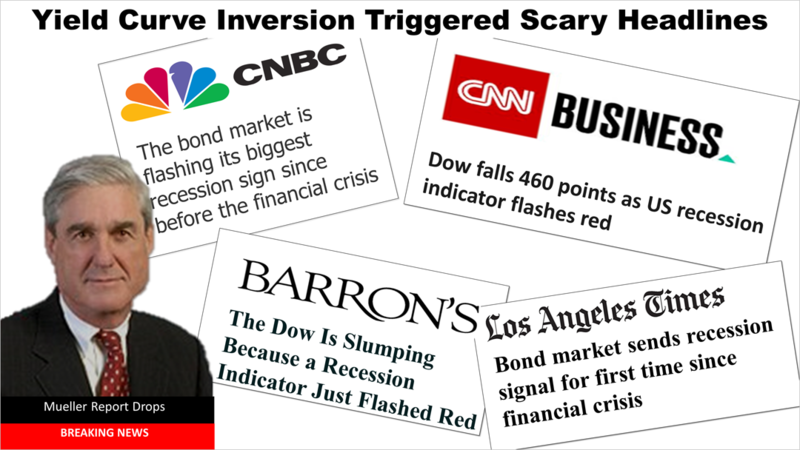 Still, the yield curve worries triggered enough fear to cause the Standard & Poor's 500 stock index to drop 1.9% on Friday, closing at 2,800.71, and 1% from the close of 2,822.48 last Friday, which was up sharply from 2,743.07 a week earlier. A key growth investment in a broadly diversified portfolio, the S&P 500 index suffered a 19.8% plunge from September 20th's all-time closing high to the Christmas Eve closing low of 2,351.10. After the stock market closed on Friday, special counsel, Robert S. Mueller III, delivered a report on his inquiry into Russian interference in the 2016 election to Attorney General, William P. Barr. Stock markets in after-hours trading were up slightly following the news.